Destination Thailand’s third anniversary means another huge festival at Yonge Dundas Square. 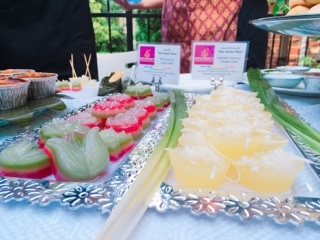 One of the largest in Canada, the Royal Thai Embassy transforms downtown Toronto into the friendly warm country with traditional dances, exotic fruits, crafts, massages, Muay Thai, entertainment, and of course authentic cuisine! Having sampled eats from six of the eight vendors at a media event, I can say attendees are in for a treat. 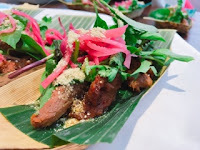 Although these will likely be the dishes served at the festival (ranging from $5-$10), the selection may change depending on ingredient availability. 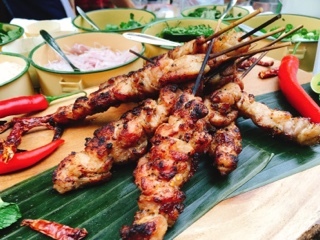 Pai’s gai ping is the most flavourful and tender grilled chicken skewers I’ve ever had. 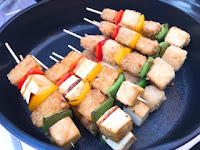 Chef Nuit Regular freely shared that the meat is so succulent due to being marinated in coconut milk. Meanwhile, the rich flavours are derived from a paste of tamarind, fish sauce, lime juice and chilies. 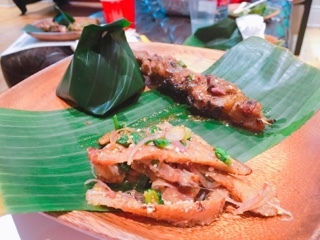 For something different try their moo nam tok, slices of grilled pork jowl mixed with a spicy sweet and sour tamarind sauce that goes perfectly with steamed sticky rice. The dish smells a good as it looks, just be sure you can handle the heat as the chili and herb sauce on top is surprisingly spicy. With the success of the Regulars’ restaurants (Khao SanRoad, Pai, Sabai Sabai), it’s not surprising that Chef Nuit is Thai Select’s ambassador of Canada where she’ll promote the program and encourage fellow restaurateurs to uphold authentic standards. Having dined at their restaurants, there’s no doubt that they serve the best Thai food I’ve ever had – as I write this I’m wistful for another skewer of gai ping. If you enjoy sauce drenched rice like myself, try the massaman lamb curry from Golden Thai. The lamb is melt-in-your-mouth tender without any gaminess and the flavourful curry goes so well with rice. Vegetarians, Golden Thai will also be serving tempeh or grilled tofu and vegetable satay skewers (served with peanut, sweet Thai, or hot sauces). 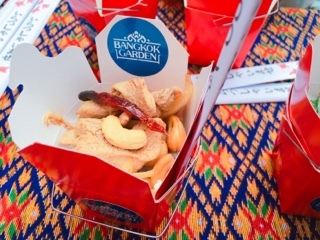 The second non-meat offering at Destination Thailand comes from Bangkok Garden who will be featuring a golden vegetable curry. If you’re a carnivore, try their spicy cashew chicken, which although looks innocent has a flavourful punch. An interesting Thai beef salad consisting of flank steak marinated with Thai basil coconut syrup, which has a sweet tartness to it not unlike balsamic vinegar. 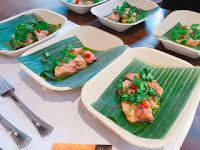 Traditional grilled lemongrass chicken is elevated with a seafood sangwa sauce that the chef explains is like a salsa verde with fish sauce and lemongrass. It’s salty and sour against the smoky grilled chicken and the dots of homemade sriracha are spicy without being overpowering. Soi Thai, based on College Street, generally sells dishes reminiscent of the street foods in Thailand. 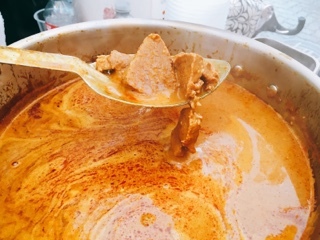 At the festival, they will be offering a hearty complete meal: khao kha moo or succulent braised pork hocks stewed in a flavourful soy sauce broth studded with star anise, cinnamon, cilantro root, garlic and white peppercorns to give it an earthy and slightly sweet seasoning. If you find it overly rich, dip it into the spicy chili-vinegar on the side that helps cut the grease. 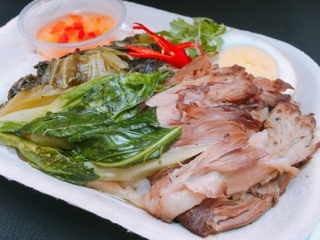 The pork hock arrives shredded over steamed jasmine rice and is served with blanched gai lan (Chinese broccoli), pickled mustard greens, and half a hard-boiled egg … you’ll leave full after this dish, so share it! My first taste of Thai desserts was an introduction with Patchmon’s, a family run eatery that concocts a wide variety of sweets. 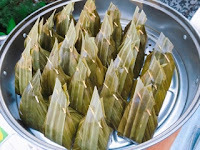 I love the kha-nhom chun, a chewy glutinous coconut layer cake – you can actually peel each layer apart. 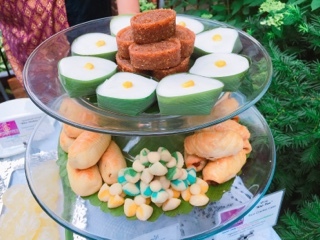 Put together with coconut cream, pandan juice and tapioca flour the dessert is light and delicious. It’s normally served at special occasions and wishes a person good luck as they travel up the layers. 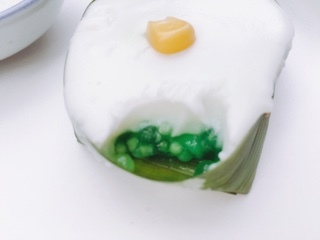 For those who like savoury and sweet combinations, the kha-nhom sai-sai is a dumpling stuffed with a savoury shredded coconut filling, lightly sweetened with palm sugar and coconut cream, and then steamed in lotus leaf. Their ta-goe is another surprising dessert, starting off as a luscious coconut cream on top but below a slightly salty tapioca layer with young coconut and corn studded throughout. With tons of desserts, Patchmon will be offering a mix-and-match plate. 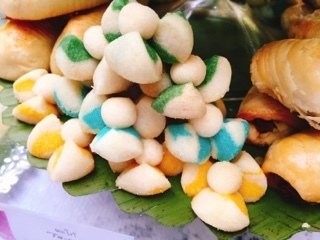 Arrive early and try their gleeb lum duan cookies shaped like a flower. The shortbread like cookies are finished with a food safe candle that adds a light charcoal taste and fragrance, but it can dissipate as the day advances so won’t be as pronounced for later customers. Judging by the hot sunny weather Toronto has been graced with this year, it’ll likely be a beautiful warm day. So, you’ll likely want a cold drink to wash down all the spicy eats. 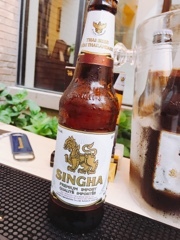 Luckily, Singha beers will be on hand selling their brews for $6; head to their special seating area for a refreshing cold drink. 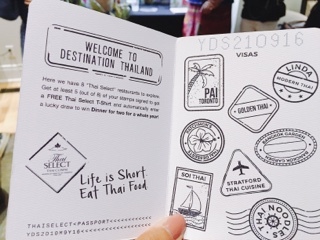 Don’t forget to pick up a free passport and have it stamped at each vendor. Visit at least five of the restaurants and you’ll receive a free t-shirt and be entered into a contest to win meals for two for one year (limited to two visits per month)! Visitors can even get a relaxing massage at two places: Shivaga Thai Massage and Traditional Thai Massage Association of Ontario. They’ll offer services with varying timing, but a massage is about $65. After an afternoon of eating and drinking how relaxing would a massage be? Just try not to fall asleep.